Need storage?You're in the right place! Family owned and operated, Pack Rat and Big Door Storage offers self-storage units for small storage needs and large storage units with doors up to 14 feet high. Our storage sites are professionally maintained, clean, and secure. 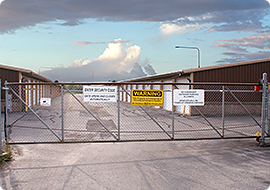 Pack Rat and Big Door Storage are conveniently located close to the freeway in Neenah and Menasha, respectively. For a hassle-free storage experience, contact us today. Short-term or long, big or small - we can handle all of your storage needs. We have two locations in Neenah and Menasha areas to better serve you. Payment options include cash, money orders, checks and/or credit cards. We offer storage rooms from 6’ x 10’ up to 14’ x 50’ allowing you to store just about anything short of a semi! Ceiling heights range from 9’ up to over 15’. Door sizes range from 9’ wide x 8’ high up to 12’9” wide x 14’ high.